An armed MQ-9 Reaper drone. In recent years, drones have emerged as the United States' weapon of choice. They enable the US to intervene in conflicts without putting its soldiers in harm's way, and seemingly offer an alternative to costly interventions - as in Afghanistan and Iraq. Armed drones have performed remarkably well in US counter-terrorism strategy in Pakistan and Yemen. There, they've killed leaders and driven out terror groups. There are pros and cons to the use of drones. But the underlying problem is that casualties alone cannot defeat a terrorist group like al-Shabaab. 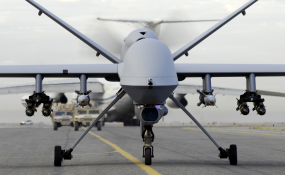 In all, drone strikes in Somalia are not a game changer. They are a tool to manage the threat of al-Shabaab, but there's no way they'll defeat the group entirely. Drone strikes inside Somalia have a long history. As early as January 2007, a predator drone was used to track Al Qaeda operative Abu Taha Al Sudani's convoy, which was then attacked by a US gunship. However, until June 2011, drones were not used as a separate attack medium. The US preferred to rely on a combination of cruise missiles, gunships and attack helicopters. In March 2017, US President Donald Trump intensified the use of drones by designating parts of Somalia an "area of active hostilities." This gave lower level commanders the power to designate targets and approve drone strikes. By September, the Trump administration dismantled several Barack Obama-era restrictions, granting more freedom to local commanders to order drone strikes. Some of these target al-Shabaab bases. In 2018, bases in Somalia's Lower Shabelle area were repeatedly attacked by US drones. These attacks left more than 80 al-Shabaab militants dead in the space of about six weeks. A third type of attack is the VIP killing mission, which targets senior al-Shabaab leaders. Only three of these were launched in 2018 - and all failed. Such operations often depend on inside intelligence from spies on the ground close to the targeted leaders. In Somalia, there are many factors that keep al-Shabaab going. Among these are clan allegiances, the lack of local protection against forced recruitment, and poverty. In one study, for instance, a majority of 39% of al-Shabaab recruits cited economic reasons as what finally "pushed" them to join the group. These ensure that al-Shabaab can fill up the ranks with fresh recruits after drone attacks, especially if friendly ground forces cannot be deployed to take advantage of the situation. The troubled Somali army often lacks the capacity to move in and sweep up after a drone attack, which would do more to hamper al-Shabaab's activities in the long run. VIP killing missions also seem to have been of limited effect, perhaps because of limited US intelligence in the region. The killing of al-Shabaab leader's in 2014 did not lead to the predicted fragmentation and internal conflict. Drone strikes also kill ordinary people who aren't affiliated with any terror groups. These deaths are seldom highlighted by the US military - but they're often reported in Somali media, which leads to some animosity from civilians who fear they will be accidentally targeted. What's needed is local protection for ordinary Somalis: both to prevent the group from recruiting more members and to guard them against al-Shabaab's attacks. This will require boots on the ground which Somalia's own army is best placed to do in the long run.